Police teargas community, arrest journalists and declares virtual martial law amid protests after killing of Michael Brown. For a sixth-straight day African Americans and their supporters have remained in the streets of Ferguson, Missouri protesting the blatant police killing of 18-year-old Michael Brown. The student was gunned-down on Aug. 9 by an unnamed law-enforcement officer who the authorities are more concerned about protecting than the community under siege. 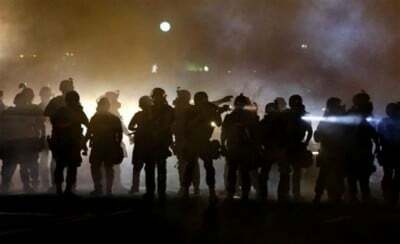 On the night of Aug. 13-14, police in militarized “riot gear” teargased, pepper-sprayed and fired bean bags and rubber bullets into sections of the African American community forcing people off the streets. Journalists and their camera crews from the Washington Post, Huffington Post, Al Jazeera and many others were gassed and even arrested by St. Louis County SWAT teams. Military equipment utilized in war zones such as Afghanistan, Iraq, Libya, Somalia and Yemen was deployed against the African American people in Ferguson. Humvees and anti-mining devices were very much in evidence when SWAT units swept through the affected neighborhoods which have refused to end their demonstrations. The Pentagon through federal law-enforcement assistance projects have turned over these deadly weapons to local agencies principally in anticipation of mass protests and unrest within national oppressed communities. CNN reported on Aug. 14 that at least $450 million in military equipment has been transferred to local law-enforcement agencies over the last year from the Defense Department. Claims that Molotov cocktails were thrown at police thus necessitating such military tactics has been refuted by journalists and eyewitnesses. Similar assertions that Brown was threatening the white police officer who gunned him down were also denied by several onlookers. Numerous people attest to the shooting death of Michael Brown while he stood with his hands up before the police and was then struck several times at close range. Demonstrators have raised the slogan “Hands Up, Don’t Shoot!” during protests that have continued daily in Ferguson, a majority African American suburb of St. Louis, where white politicians and police dominate the social and political culture of the city. The Mayor James Knowles III of Ferguson told CNN that the county police had control of the situation in the unrest areas. He defended the refusal of the powers that be not to release the name of the officer who killed Brown, as was supposed to be done on Aug. 13. All of the public statements from officials in Ferguson have sought to apportion blame for the unrest on the African American people, mainly youth, who have defiantly refused to leave the streets since the killing of Brown. The militarization of the police in the city represents the current approach to the burgeoning social and political problems so widespread among African Americans and other oppressed communities in the U.S. Incidents of racist violence have increased since the ascendancy of the presidency of Barack Obama. Nonetheless, the president’s approach to urban problems of growing unemployment, underemployment, poverty, disenfranchisement and repression, has been one of “benign neglect” and even hostility, rather than objective assessment and programmatic engagement. Since Obama took office in 2009, he has gone out of his way not to address the rising phenomenon of poverty and alienation among large sections of the population in the U.S., including African Americans and Latinos, but not necessarily exclusive to these communities. The president’s response to the crisis in Ferguson is indicative of his lack of commitment to seriously address the conditions of the African American people by maintaining that there are no fundamental structural deficiencies within the U.S. system. Obama in a press conference during his vacation on Martha’s Vineyard Aug. 14, reiterated the call for law and order saying that “there was no excuse for violence.” Yet it was the police who gunned down Michael Brown that initiated the mass demonstrations by the people of the area and placing these developments on news pages throughout the world. Although speaking of the arrests of journalists, he never mentioned the additional state-violence carried out by the police against African American youth and other demonstrators. There was no condemnation of the systematic use of teargas, pepper spray, concussion bombs, bean bags and rubber bullets perpetuated against the African American people who are forced to live under a white-dominated political landscape on a daily basis. There was also two other African Americans critically wounded since the unrest began. One man was allegedly shot by the police who claimed he was armed. However, how can the public honestly belief the allegations of the police when they have refused to even release the name of the assailant who killed Michael Brown? Later Obama said that we are “one American family with common values.” This is perhaps the most preposterous of all of his statements because any informed person would know that the overall socioeconomic conditions facing African Americans across the U.S. indicate clearly that there is national oppression enforced by the armed apparatuses of the state. Rates of joblessness, underemployment, incarceration and victimization by the police in disproportionate numbers in relationship to African Americans, are well documented. Nonetheless, Obama, Congress and the owners of multinational corporations ignore these realities when making such utterances to the general public. Obama’s suggestion that there should be “peace, calm and transparency” in Ferguson is insulting to not only the people of the region but to the national and international communities in general. Peace under the circumstances of protected racist state-violence is unsustainable. Obama’s failure to speak directly to the concerns of the oppressed is contributing even further to the unpopularity and policy failures of his administration. Interestingly enough, prior to Obama making his statements on the rebellion in Ferguson, he discussed the latest U.S. military bombing and ground interventions in Iraq. This same candidate that pledged to end the Iraq occupation in 2008, not only continued the war and enhanced the conflict in Afghanistan for years, but is re-entering the Iraqi theater under the guise of protecting civilians and U.S. interests. What civilians and U.S. interests are at stake? Obviously not those of the African American community in Ferguson and other urban areas throughout the country, but those of the multi-national oil and mining firms along with the international financial institutions. The city of Ferguson has a two-third African American majority but the mayor is white and obviously out of touch with the aspirations of the predominant population in the town. Statistics reveal that only three African American police officers are employed out of 50 for the suburb. Therefore, what exist in Ferguson is white-minority rule on behalf of private property and the state. This is a model that exists and is spreading across the U.S. In the city of Detroit, formerly a bastion of labor and Black political power, has now gone the way of Ferguson. A right-wing multimillionaire venture capitalist Rick Snyder acting as governor has appointed a lackey, Kevyn Orr, to do his bidding in the form of dictatorial emergency management. A white mayor, Mike Duggan, has been imposed on Detroit from Livonia. This political official embodies secondary authority to the governor and his emergency manager and serves merely as an agent of multinational and finance capital. Consequently, the majority population in Detroit remains under occupation where thousands are subjected to healthcare cuts, water shut-offs and monetary liability for the failures of generations of economic policies directed from Wall Street and the Pentagon. This is what corporate America has in store for its burgeoning people of color communities and impoverished working class in general. The militarized police units are being activated to maintain the dictatorship of capital utilizing racism as a rationale for further repression and outright expropriation of the people’s wealth and maintenance of their political subordination. Obama’s cabinet meetings on Iraq and Ferguson at Martha’s Vineyard can only result in more of the same. Putting a new face on super-exploitation and national oppression is futile. Change must be fundamental in re-directing wealth and authority from the minority of the ruling class to the majority of the people. Only when these policies are implemented will there be any hope for a peaceful future within American society.